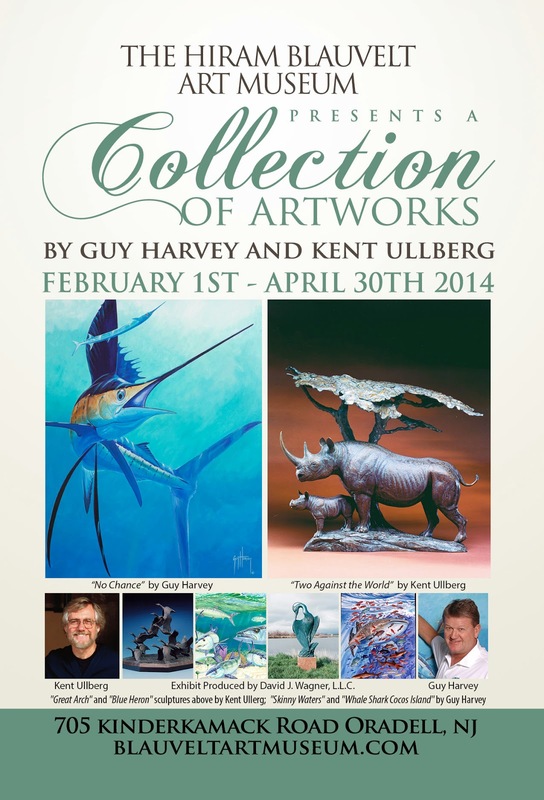 The Hiram Blauvelt Art Museum, Oradell, NJ, will host the traveling museum exhibition of sculpture by Kent Ullberg along with a companion exhibition of paintings by Guy Harvey from February 1 - April 30, 2014. The pairing of the two artists for this particular exhibition was a result of a special request by Blauvelt Board Chairman, Jim Bellis, Jr. A reception for the artists, who are long-time friends and enjoy diving and fishing together, will be held at the museum on the afternoon of Sunday, March 9, 2014, and include book signings and formal presentations. The project is a production of David J. Wagner, L.L.C. Guy Harvey combines his significant artistic talents with a broad and deep body of knowledge as a marine biologist, diver, photographer and angler, to create marine wildlife art with an extraordinary authenticity and visual appeal. Self-taught, Guy’s artistic roots can be traced back to his childhood on the Caribbean isle of Jamaica, where he spent many hours fishing and diving with his father along the island’s south coast. Guy’s obsession with the creatures of the sea inspired early drawings of the many different fish he observed. While attending a boarding school in England at an early age, Guy became entranced by Ernest Hemingway’s “The Old Man and the Sea” — and began developing a series of sketches that years later would prove instrumental in helping launch his career as an artist. Though Guy was interested in pursuing his love of marine art, he opted for scientific training and worked hard in pursuit of an education — both in Scotland and back in Jamaica — and a career in marine biology. Along the way, Guy was able to supplement his income by selling his art, and a loyal following led to his first exhibition in 1985 — a one-man art show at a Kingston gallery of his 44 pen-and-ink drawings inspired by “The Old Man and the Sea.” The success of the exhibition encouraged Guy to spend more time painting, and by 1986 his work had spread to Florida through a series of showings at boat shows and fishing tournaments. By 1988, Guy Harvey had become identified as one of the world’s top saltwater gamefish artists, and was experiencing so much success that he gave up his career in marine biology to pursue his hobby full-time. 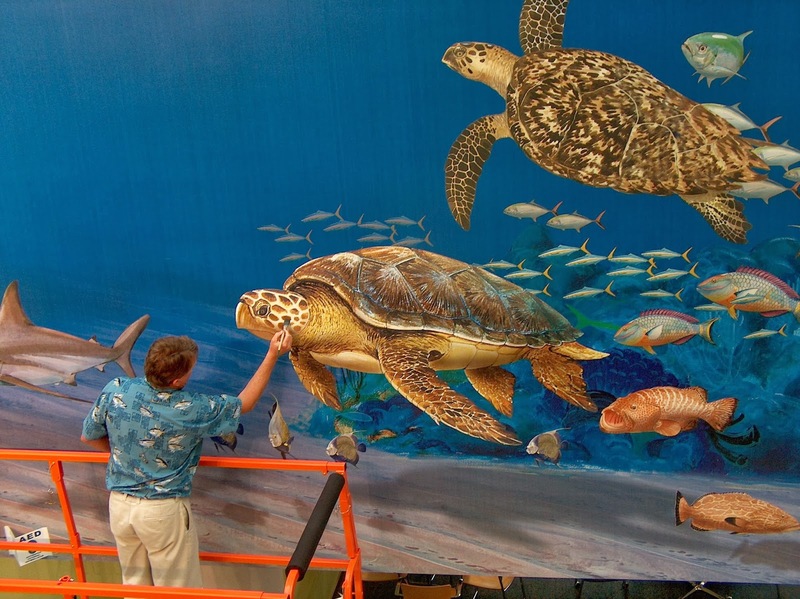 Though recognized most recently for his floor-to-ceiling murals at the Ft. Lauderdale Airport and at Nova Southeastern University in Florida — Guy is known best for his dynamic gamefish T-shirt designs. His original paintings have sold for tens of thousands of dollars, and today, reproductions of his art — often seen on magazine and catalog covers — are offered as limited edition prints, and can be found on a wide variety of clothing and gift items. Guy maintains his art studio in Grand Cayman, where he lives with wife Gillian and their two children, Jessica and Alex. Kent Ullberg was born in Gothenburg, Sweden in 1945. As a young man, Ullberg studied at the Swedish Konstfack School of Art in Stockholm, and at museums in France, Germany, and the Netherlands. In 1967, Ullberg was offered a one-year job as a safari taxidermist in Botswana, Africa. After that, he went on his own, working independently as a taxidermist and a guide. Among his clients was the Denver Museum of Natural History. This connection came about through Alec Campbell, Director of Wildlife and National Parks, and the Botswana National Museum and Art Gallery. In 1969, he hired Ullberg to assist with an expedition for the Denver Museum of Natural History to collect specimens for its new African Hall. Pleased with Ullberg’s performance, Campbell subsequently hired Ullberg as Curator of the Botswana National Museum and Art Gallery. 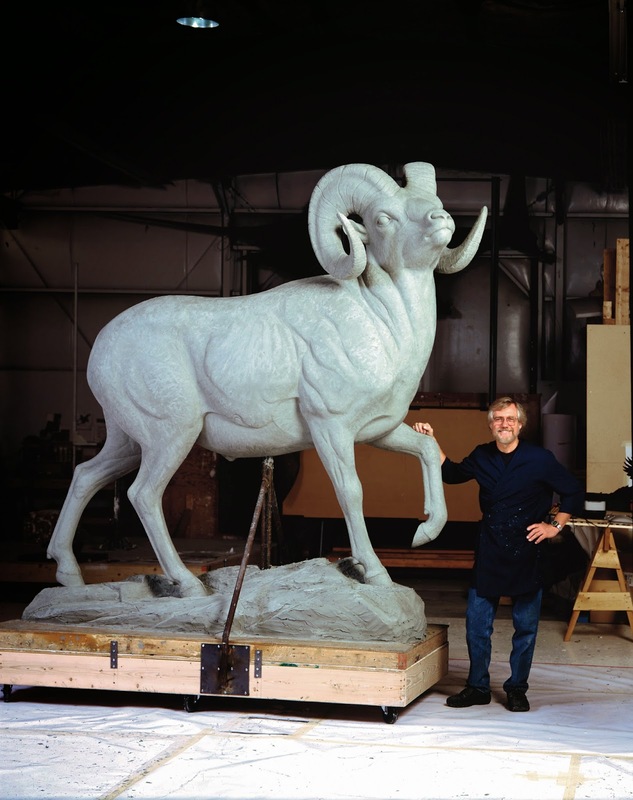 During this period, Ullberg also kept busy sculpting African wildlife. In 1974, Ullberg’s career and life were re-directed to the United States when Charles Crockett, Director of the Denver Museum of Natural History offered him an appointment to curate the museum’s African Hall, at the highest salary possible, along with airfare and relocation expenses. Realizing that this was an opportunity of a lifetime, Ullberg accepted and flew from Gaborone to New York where he arrived on May 17, 1974, and then on to Denver. In Denver, Ullberg quickly befriended various artists but none more helpful than sculptors, Kenn Bunn, and George Carlson, a second-generation Swedish-American. They introduced Ullberg to Bob Zimmerman, who had established a foundry named Art Castings of Colorado in Loveland about 30 miles north of Denver. Today, Kent is a member of a number of important art organizations which have honored him with prestigious awards. These include, in New York City, Allied Artists of America, National Academy of Design, National Arts Club, National Sculpture Society, and the Society of Animal Artists. Those outside New York include the American Society of Marine Artists, Ambler, PA; and the National Academy of Western Art, Oklahoma City. Kent Ullberg supports wildlife conservation and has given generously to its various causes. He resides with his wife, Veerle on Padre Island, in Corpus Christi, Texas.